LEED certification is a globally sought accreditation signifying that a building project meets specific environmental and energy requirements. Doshi Associates has succeeded in creating elite energy and environmental designs thus earning the certification for green building strategies and practices. ASHRAE was created in 1984 as a way to identify and define quality standards for engineers to strive for on a global scale. ASHRAE distributes awards for the advancement of HVAC&R arts and sciences. DAI earned first place recognition for providing elite engineering technology solutions on both a regional and a statewide scale. Doshi Associates is the youngest, smallest, and first minority owned A&E firm to obtain the highly prestigious Ford Q1 Award. The award signifies that a supplier has achieved premier standards in quality, efficiency, and service. Michigan’s private 100 named Doshi Associates as one of the fastest growing companies in Michigan. DAI achieved this honor by sustaining an extraordinary growth rate, creating jobs in Michigan, and helping to stimulate the local economy. The Detroit News featured a “Smart Money Success” article on DAI’s CEO Shailesh Doshi. The article outlines the early success of the company despite starting in a slumped economy and initially having a small work force. Doshi Associates, Inc. is certified by the National Minority Supplier Development Council, Inc. as a Minority Business Enterprise. 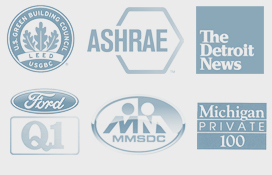 DAI is proud to be a 100% minority owned firm headquartered in Troy, Michigan. COPYRIGHT © 2014. Doshi Associates Inc.